For thousands of years Greeks have been using thick sheep and goat’s milk to make this rich custard pita pie. It’s a sweet, delicate pie, with it’s many layers of crispy phyllo leaves. In Crete and Northern Greece, it’s still called by it’s Turkish name Bougatsa. This dessert can be eaten hot or cold. I love it straight out of the oven, warm- while on the other hand the next day it’s delicious cold for breakfast or for an afternoon snack. Bougatsa is filled custard without the syrup, and it’s sprinkled with powdered sugar, a perfect breakfast. 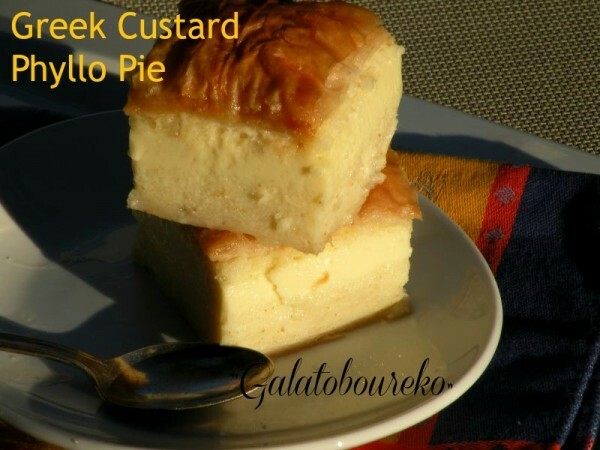 Both require making a custard, so Galotoboureko is often a special treat for company or a special occasion. Greek Custard Phyllo Pie "Galatoboureko"
This luscious custard pie is very traditional in the Greek cuisine. Set some time aside to make this but it's worth every bite! It can be served warm, room temperature, or cold. I prefer it cold! Scald milk in a large pot and cook on low. Slowly whisk in semolina stirring constantly,and bring mixture slowly to a boil and stir until slightly thickened like pudding about 15-20 minutes. Beat egg yolks, 2 cups sugar, and vanilla in a mixer for 5 minutes until pale and fluffy. In a separate bowl beat egg whites until stiff peaks form. Slowly whisk eggs yolks into cooled milk mixture. Butter a deep 11x17 inch baking pan, with 2-3-inch sides. Place one sheet of phyllo in pan and brush with butter. Pour the custard over the phyllo. Repeat layering the phyllo on top until all of the sheets are used. With a sharp knife or scissors, slice through the top layers of the phyllo making 2-3 inch squares. Bake for 10 minutes, reduce to 350 degrees and bake for 45 minutes, or until golden. Turn off oven and leave pastry in the oven for 10 minutes. Test with a knife, with it comes out clean it’s done. While the pastry bakes make the syrup. Place all the ingredients in a medium pot. Pour the cooled syrup over galotoboureko. Cut all the way to the bottom with a sharp knife, and serve warm. Or cool and place in the refrigerator and serve cold. This recipe can be halved, and placed in a smaller pan. Can be frozen before cooking, defrosted, and baked. I cut the 11x17 pan , 4x6 to create 24 pieces. Note: This filling puffs up quite a bit, but as it cooks it deflates. This is what makes the filling so creamy. I’ve had this dish before and it was so delectable that I decided to scour the internet for a recipe. I would appreciate a clarification, though. The recipe calls for semolina but then within the recipe you refer to it as cream of wheat. As far as I know cream of wheat is farina. 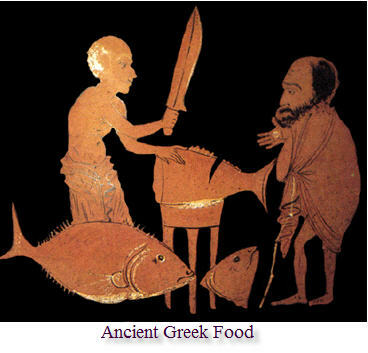 From my research, farina and semolina are different as semolina comes from durum wheat and has a higher protein content for the making of gluten and farina comes from any other type of wheat. Other recipes I’ve looked at are split on whether they call for one or the other. Should I be using fine semolina or cream of wheat like I would find on the cereal aisle? One other thing. My friend who is Greek told me once of making baklava that there is a trick to pouring the syrup over the pan which allows the phyll0 to stay crispy. Should the syrup be chilled and the should I pour the syrup over the pan while it is hot, before I cut into it? I remember when I first started baking baklava this is the question I would ask my mother over and over again. Hot baklava to cool syrup. So, pull out the baklava straight from the oven, and pour the cooled syrup on top. Let it sit for a day before cutting. Thank -you Katie for question. I did adjust the recipe for semolina. I prefer semolina for a smoother texture. Many folks have a problem with the feel of cream of wheat or farina when I cater. So, I use semolina simply for that reason.